The day that Druid's coffin bones sank was June 17, 2003. This is what his feet looked like just 15 days later. The exit wounds covered one half to two thirds of the coronary band. The bottom of his feet looked terrible. I could see the coffin bones in all four hooves. 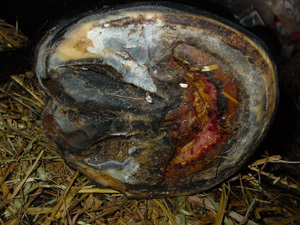 Here is what the hooves looked like just 33 days since the coffin bones sank. This prolapsed ridge at the coronary band has grown down at least half an inch. The wound was starting to granulate and get proud flesh. At this point in time, Druid was placing his front feet flat on the ground. As the months went by, he began knuckling over and not putting his heels down. This is before and after a trim. I was trying to keep the heels lowered, but I should have been bringing the toe and sides back closer to the coffin bone. 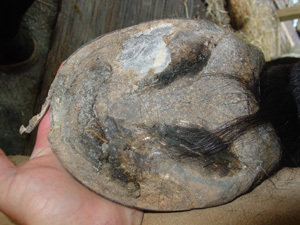 I could clearly see where the coffin bone was, but I was afraid to work the hoof capsule back this far. I think that my fear ended up prolonging the healing of his feet and caused him undue pain later. His foot was just too big. The walls were too far away from the coffin bone. When the lamina became weak, they just completely gave way. I wasn't trimming from the top yet. I kept looking at the edge of his sole and using it to gauge how much to trim. In this situation, that sole was all dead and weak. I should have trusted the edge of the coffin bone and used it as a reference. This is Druid’s right front foot. It never looked quite as bad as the left, but he acted like it hurt as much. 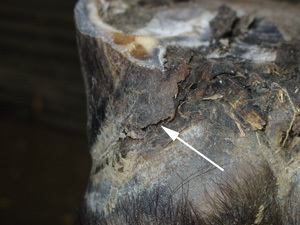 I think that this picture shows how the hoof wall was folded. It was crimping the underlying structures. 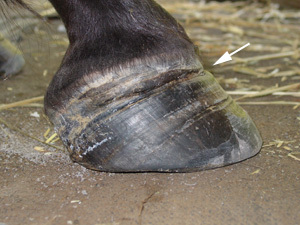 As the “fold” grew down and the toe was pulling forward, it caused him a lot of pain. I should have been rasping the toe back more aggressively and working to get rid of the fold. This is a crack in Druid's heel. In a few days, the heel just peeled off. I tried not to take off parts of his foot until it was obviously coming off on its own. I felt like these flaps were acting like a temporary band-aid or scab. The bottom of his back feet were complete mush. Everything was soft and pliable. The consistency was similar to normal frog tissue. It was rubbery. It looked like the bottom of an elephant’s foot. Here are the slippers that Druid wore. 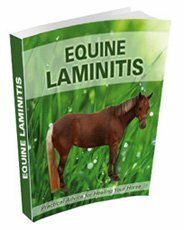 I poulticed with Animalintex Poultice pads, wrapped the feet in diapers and then slipped the boots over it all. This worked well when he wasn’t moving much. As he got more mobile, the slippers did not stay on well. The prolapsed portion of the coronary band developed proud flesh (marked with an arrow). It was amazing how quickly the hoof wall was growing down. It had only been a month and a half since this had opened up. From the top, the hooves still looked somewhat normal. Because the front hoof wall was the only rigid structure left on his foot, I did not have the courage to back the toe up more aggressively. Later, it will be more obvious that I should have. The soles were very strange looking. He had begun to walk on his toes and it was making the soles bulge. The frog was blended in with the sole. If you look carefully, you can see that he had proud flesh growing on is sole (I have marked the proud flesh with arrows). I was losing all of the basic landmarks that I usually followed when I trimmed from the bottom of the foot. The frog was weird, the bars were peeling off and the heels were also sloughing. The X-rays taken at six months show huge improvements in his feet. The eighth month is when Druid's feet really started changing shape.